Embraer started working with E-Jet customers to define the performance goals and technical characteristics of the new aircraft family. One of the considerations was a composite airframe. Early 2012, Air Lease Corp advised Embraer to stretch the Embraer E-190 by 1 row (4 seats) and the E-195 by 2-3 rows (8-12 seats). The aim was to add capacity to compete with the CS100, while allowing for pricing flexibility in the light of much lower development costs associated with an airplane upgrade rather than a clean sheet design. Adding to this advantage is the huge customer base of Embarer’s E-Jets. A customer would prefer an upgrade “within the aircraft family" for near-seamless operational integration, rather than an all-new aircraft. Embraer claims to be not just re-engining, but investing heavily to achieve the efficiency of a clean-sheet design. In January 2013, Embraer selected the Pratt and Whitney Geared Turbofan PW1000G series to power the second generation E170 and E190/E195 aircraft, which it calls the “E-Jet E2 family". The wings will feature a higher aspect ratio, longer wingspan, and raked wing tips instead of winglets. The landing gear will be lengthened to accommodate the larger engines, and the flight deck will feature the Honeywell’s Primus Epic™ 2 advanced integrated avionics system with large landscape displays, advanced graphics capabilities, and Honeywell’s Next Generation Flight Management System (NGFMS). The new airplanes will be 100% fly-by-wire, unlike the in-production E-Jets. The E-175 E2 can seat 88 passengers in a single class, in a comfortable 31" seat pitch. The in-production E-175 can seat only 78 passengers, comfortably, and 88 with an undesirable 29" seat pitch. The E-190-E2, which is poised to continue the legacy of the well-performing in production E-190, comfortably seats an additional 6 passengers in a uniform 31" seat pitch. 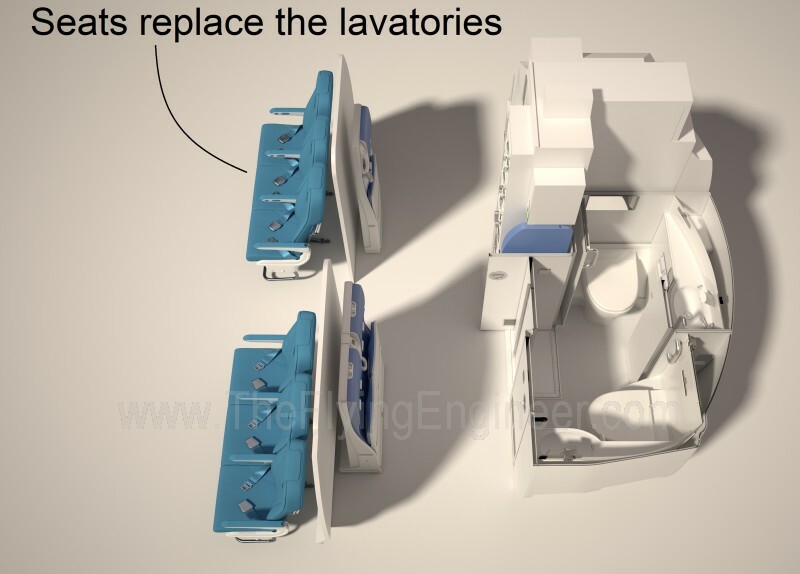 The existing E-190 can seat 114 passengers, but with a compromised seating comfort. The fuel efficiencies of the E-190-E2 lend it more range than the E-190. The E-195-E2 seats 132 passengers in a uniform 31" seat pitch. The In-production E-195 can seat no more than 124 passengers in high capacity, and 116 in single class (with 31% of the seats featuring a 32" pitch, and 69% featuring a 31" pitch). Sometime in 2009, Embraer had studied an aircraft of such capacity, dubbed the E-195X, which would have used the same engines as the E-195. The concept was eventually dropped in 2010 the light of degraded aircraft performance in the absence of a re-engine.